Braised baby artichokes, with plum tomatoes, peas and herbs, adapted from this recipe at Michael Natkin’s most excellent food blog, Herbivoracious. It’s mostly the same recipe, save for the substitution of chopped plum tomatoes instead of the cherry tomatoes, and peas instead of the fennel. This version as pictured isn’t vegan or gluten-free because there’s just a teeny bit of freshly grated Parmigiano-Reggiano cheese, and a few pieces of homemade bread beneath the artichokes. However, Michael’s recipe IS gluten-free and vegan, and I highly encourage anyone who loves artichokes to please check it out. 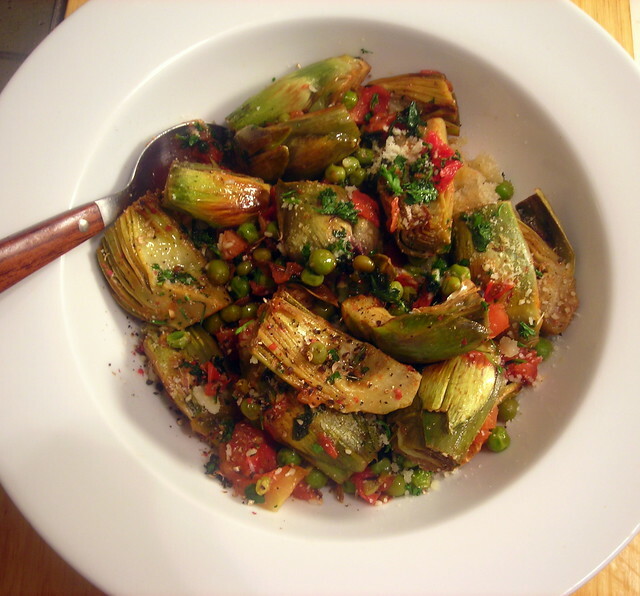 You could say that I’ve been waiting quite impatiently for summer to arrive and for artichokes to appear at our markets so I could jump at the chance to make this dish. 07 Jun	This entry was published on June 7, 2012 at 2:06 pm. It’s filed under American cuisine, food, food photography, summer, vegetarian and tagged artichokes, dinner, food photography, peas, summer, tomatoes, vegetarian. Bookmark the permalink. Follow any comments here with the RSS feed for this post. Thanks for stopping by, Becca, and for the comment. I do love artichokes and am always looking for new ways to cook and eat them. Definitely one of the more under-appreciated of summer vegetables.